(b) Hence, determine the nodal reactions. 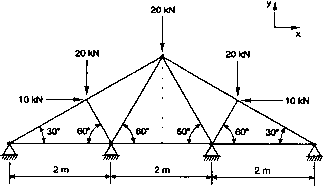 9.2 Figure 9.51 shows a roof truss, all members of which are made from steel, and have the same cross-sectional area, such that AE = 10 MN, throughout. 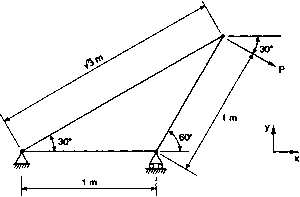 For the purpose of analysis the truss can be treated as a pin-jointed plane frame. Using the displacement based finite element method, taking advantage of any symmetry and redundancies and treating each member as a rod element, determine the nodal displacements with respect to global coordinates. 9.3 A recovery vehicle towing jib is shown in Fig. 9.52. 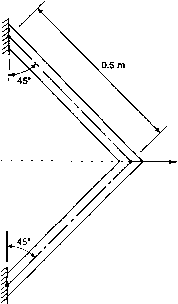 It can be assumed that the jib can be idealised as a pin-jointed plane frame, with all three members made from steel, of the same uniform cross-sectional area, such that AE = 40 MN, throughout. Using the displacement based finite element method and treating each member as a rod, determine the maximum load P which can be exerted whilst limiting the resultant maximum deflection to 10 mm. 9.4 A hoist frame, arranged as shown in Fig. 9.53, comprises uniform steel members, each lm long for which AE = 200 MN, throughout. (a) Using the displacement based finite element method and assuming the frame members to be planar and pin-jointed, determine the nodal displacements with respect to global coordinates for the frame loaded as shown. (b) Hence, determine the corresponding nodal reactions. (b) hence, for the idealisation shown in Fig. 9.54, determine (i) the nodal displacements with respect to global coordinates, and (ii) the resultant maximum stresses at the built-in ends and at the common junction. 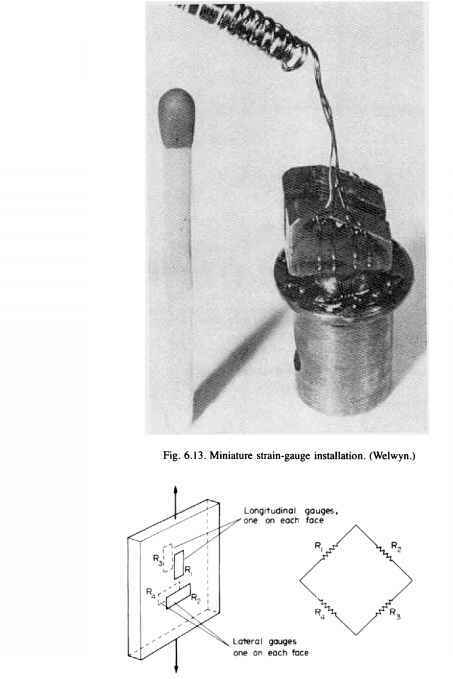 9.6 A stepped steel shaft supports a pulley, as shown in Fig. 9.55, is rigidly built-in at one end and is supported in a bearing at the position of the step. The bearing provides translational but not rotational restraint. Young's modulus for the material is 200 GN/m2. (a) Using the displacement based finite element method obtain expressions for the nodal displacements in global coordinates, using a two-beam model. (b) Given that, because of a design requirement, the angular misalignment of the bearing cannot exceed 0.5°, determine the maximum load, P, that can be exerted on the pulley. (c) Sketch the deformed geometry of the beam. (a) determine the nodal displacements with respect to global coordinates. (b) A modal analysis reveals that, to avoid resonance, the vertical stiffness of the out-rigger needs to be increased. Assuming only one of the members is to be stiffened, state which member and whether it should be the cross-sectional area or the second moment of area which should be increased, for most effect.